I was born and raised in a middle class Sikh family in India. As a child, I accompanied my parents to the Gurudwaras (Sikh places of worship) on Sundays where I learned about religious values. My early education was in traditional Sikh institutions, and I followed basic Sikh tenets. 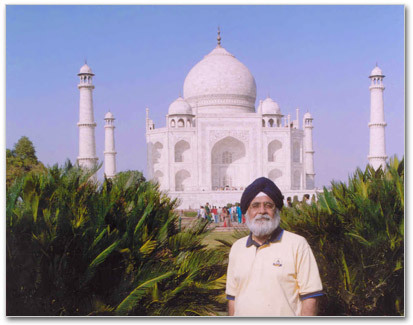 In 1966, I came to America for higher studies and earned degrees in mechanical and environmental engineering. In the late 1970s, I began to ask myself questions: Who am I? Why I am here? What is the intended purpose of life? Soon after, I found the Teachings of the Ascended Masters taught by Elizabeth Clare Prophet, the annointed messenger of the Great White BrotherhoodA spiritual order of Western saints and Eastern masters. The word "white" refers not to race but to the aura of white light that surrounds these immortals.. I have been a student of the teachings for over thirty years, reaffirming my Sikh beliefs against the backdrop of a bigger picture. And I have come to understand the beauty of different religions—like divine emanations from the one source manifesting unique qualities of God’s love in the world. It is my earnest hope that seekers of Truth from East and West will be inspired by their Inner Teacher and rejoice in finding long-sought answers to their questions on this website. As you study the Teachings of the Ascended Masters, I trust you will be comforted by rediscovering your divine identity, recognizing your True Self, and celebrating your holy inheritance. This website is dedicated to the Ascended Master El Morya. During one of his earlier embodiments as the Moghul Emperor Akbar the Great (1542-1605), he displayed much religious tolerance towards his subject to absorb the best in all religions to pursue his dream of realization of a common Light and dissolve barriers between religions. continues to pursue the realization of a common Light and the dissolving of barriers between religions. This website is dedicated to him as his dream come again. May it bring forth knowledge of the indwelling light for you.